After last summer’s WWDC, Apple started charting iOS adoption numbers on Dev Center, its portal for registered Mac and iOS developers. According to data from March 24, 2014, a whopping 85 percent of the iPhone, iPod touch and iPad devices in the wild ran iOS 7 at the time. The figure has now grown to 87 percent device, as per latest App Store numbers. 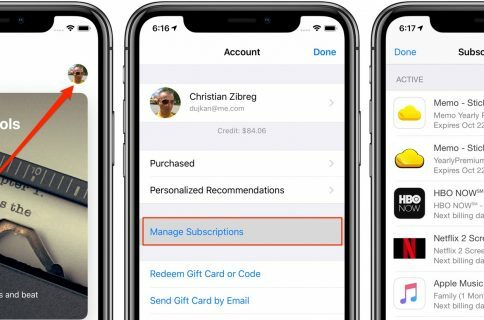 Although iOS adoption rates are now plateauing following the software’s public release more than six months ago, the two percentage-point difference in two weeks time is nonetheless a notable accomplishment. 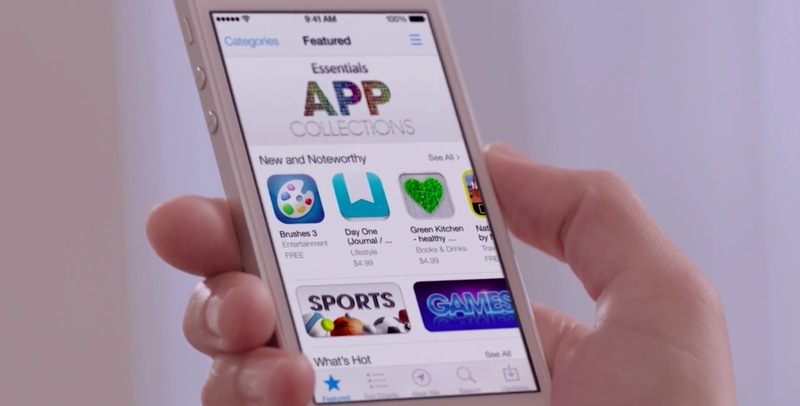 The graphic seen in the top right is from Apple’s developer page and is based on a snapshot of App Store device access during a seven‑day period ending April 6, 2014. Apple released iOS 7 for public consumption on September 18, 2013 and already by December 1 78 percent of active devices were running the software. As for Google, the company’s official Android dashboard paints a messy picture of Android version distribution. Data collected during a 7-day period ending on April 1, 2014 shows that Android KitKat, the latest and greatest version of Android released six months ago, is installed on just 5.3 percent of Android smartphones and tablets, excluding vanilla devices that don’t use Google’s Play services. But how’s such a rapid adoption of iOS even possible? 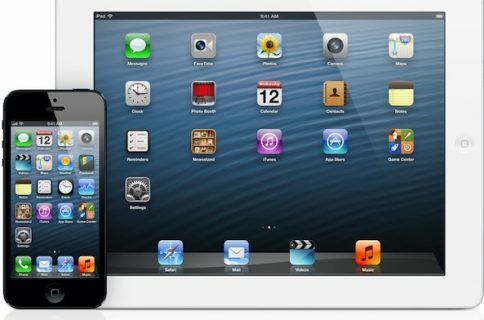 For starters, with iOS 6 Apple built a software update mechanism right into the bowels of its mobile operating system. The feature, available in Settings > General > Software Update, periodically checks for new updates. When it finds one, it downloads the installer in the background over Wi-Fi (iOS 7 lets you delete these OTA installers to free up storage space) and puts a badge on the Settings icon on a user’s Home screen to inform them of a pending update. Over-the-air updates install without the need for desktop iTunes, which was historically the main sticking point that discouraged some people from applying iOS updates in the first place. Last but not least, Apple only has a few iPhone, iPod touch and iPad models to develop against versus Google, whose Android software powers countless devices from dozens of vendors. Also important: lazy carriers and UI skinning. 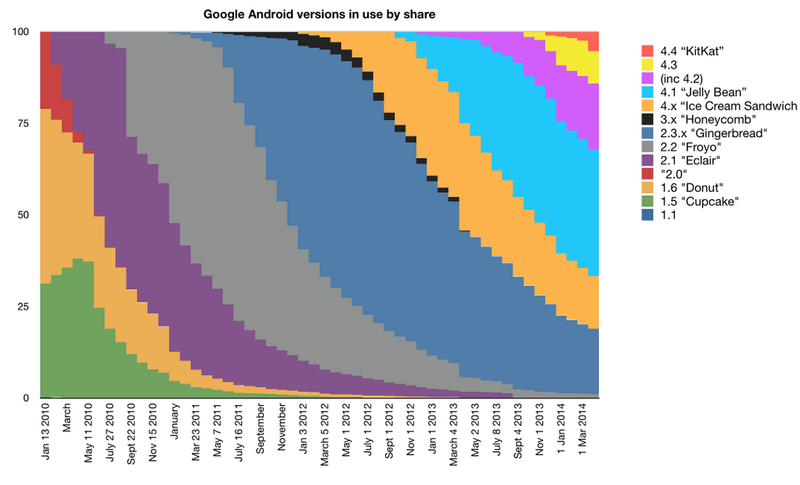 In fact, Android is at its most fragmented ever, with four major version each having less than a ten percent share. This allows Apple to keep device fragmentation at a minimum and support older hardware. The same goes for desktop. Again, here Mac OS X targets very specific Apple hardware versus Windows that must support a wide variety of configurations, components and manufacturers. iOS 7.1 also played a factor. 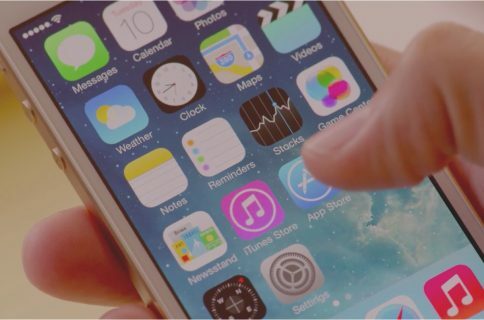 The first major update to iOS 7 has polished the user interface while bringing out new features like CarPlay and Touch ID/Siri improvements and making devices zippier and more stable. In turn, most of the people who originally passed on iOS 7.0.x versions over those concerns have responded by finally upgrading their devices to iOS 7.1. So, what about the eleven percent of iOS devices that are still on iOS 6? Most of these are likely older hardware so don’t expect adoption rates to come within the spitting distance of the 100 percent milestone. 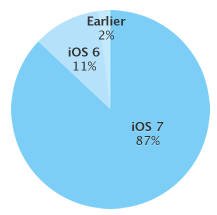 For instance, by last June some 96 percent of devices were on iOS 6. Apple’s annual conference for developers is kicking off on Monday, June 2, in San Francisco so this will be it as far as iOS 7 is concerned because all eyes will be on the upcoming iOS 8.